Giveaway! Leave a comment below by midnight, August 9, for a chance to win a signed copy of Between a Book and a Hard Place. Please include your first name and email (such as readerreader.com) so you can be notified. Sorry US only. Dev here. As the owner of Devereaux’s Dime Store and Gift Baskets, there’s a lot I enjoy about my job. I love being my own boss. I love selecting merchandise from bygone days. And I love creating gift baskets, be they naughty or sweet. However, as I may have mentioned before, I really look forward to choosing the books for the spinner racks, which are in a place of honor front and center in my store. One rack is full of romances and the backlists of my favorite genre—mysteries. The other is new releases. The first Tuesday is the best day of the month because that’s when most new mysteries come out. Next month (September 6) my very, very favorite series has a new book debuting. It’s number nineteen and I cannot wait to visit with my fictional friend Skye Denison. Oops, I mean Skye Denison Boyd. She’s only been married for two books so I keep forgetting her new name. In her last adventure, Murder of an Open Book, Skye was only a few months pregnant, but in the one coming out soon, Murder of a Cranky Catnapper, her baby bump is considerably bigger. I wonder if that plays havoc with her Nancy Drew tendencies and her love life. I got a sneak peek at the cover and I have to say the kitty cat with the bandits mask is the cutest thing ever. The story is about pet therapy and a nasty school board member who hates animals should make for a fun read. I guess I’d better not agree to any dates with Jake or Noah for the days after the book arrives. I wouldn’t want even a hot guy to get between me and a murder mystery. 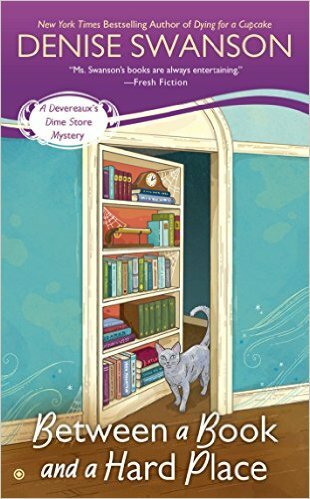 You can read more about Dev in Between a Book and a Hard Place, the fifth book in the Devereaux’s Dime Store a humorous romantic mystery series. Also more about Skye and the cute animals in Murder of a Cranky Catnapper—available for pre-order now. I want to read these books. They look great. I love cute animals in cozies. Thanks for the contest. I am almost finished with Open Book. I am ready for my next great read! 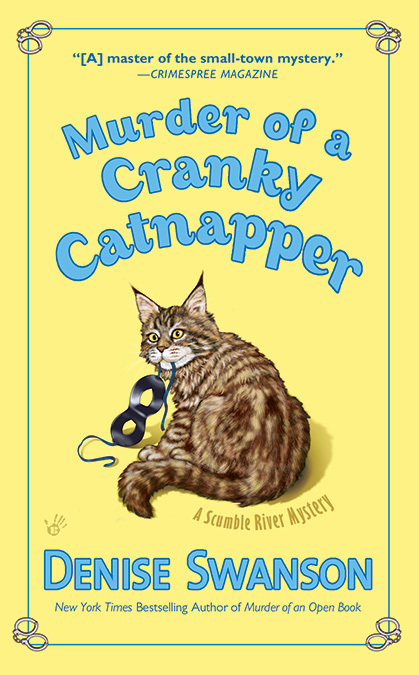 Can't wait for Cranky Catnapper!!! Hoping my preorder ships early!!! I love the Dime Store Mysteries, but have not read this one yet. Thanks for the chance to win. Great giveaway. Thanks for a chance to win a free book. this would be a good bday present for me! Love cozy mysteries, and thanks for the giveaway. noahcpatterson (at) gmail (dot) com. I read this book and it is terrific. Just what a reader expects. I can't wait to see what Dev is up to next! 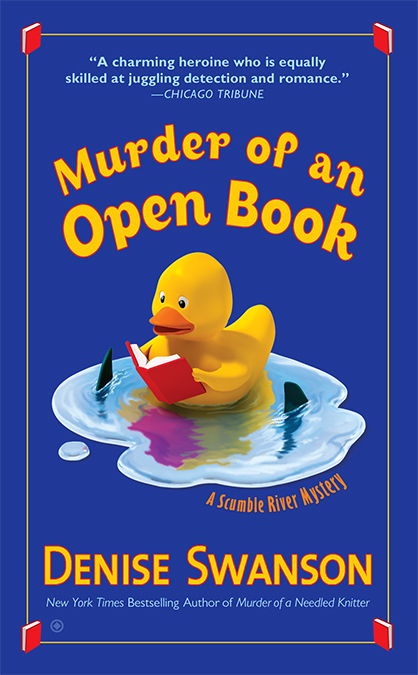 I love Denise Swanson's books, and what a great opportunity to get another one of her books! I would so love to win this. Thanks for the chance. Thanks for the chance to win! Love the cover! I am a big Scumble River fan and can't wait to learn more about Dev and the other series. Thanks for the chance to win! oohh-a nasty school board member who hates animals-sounds like a perfect murder victim to me! I would love to start reading this series! Thank you for the chance! I just started reading this series. I love it. My favorite job ever was when I worked in a small bookstore and I could open boxes and put books out! It was like Christmas every week! since it started and I love it. haven't read the dime store series. I worked at Woolworth's (a 5 and dime) many years ago. Fun times. Love both of these series! After I read one of Denise Swanson's cozies, I was forever hooked. I wish that her main characters were my friends, I love them so much. Thank you for the chance to win of her books. Fingers Crossed, thanks for the chance.